The last four months have been interesting. I didn’t really know what to expect when going from the world of a struggling not-for-profit into the world of fashion and small business, but what I’m learning is better than anticipated. Beyond fashion and creativity, I’m learning things about living. The daily lessons in slowing down, taking time and being kind to myself have been more than welcome. I used to keep a pace that was unhealthy. I fretted over things I couldn’t help and tried to fix an organization that I was just better off leaving. Now I get to create with my hands each day, listen to NPR as I work and have lunchtime conversations that truly mean something — and even better than lunchtime conversations, I get to eat a healthy lunch followed by a cappuccino. This beats the buffet of mini-candy bars that used to get me through a day. My time at the computer usually maxes out at half an hour a day. I rarely sit down. All parts of me are engaged. And when I come home, I’m home. Work doesn’t linger with me unless I want it to, and that work is never bad. My sewing room seems fresh again and all my fabric seems new. I dream of putting things together in new ways and have fallen in love with colors and textures again. Cutting out patterns doesn’t seem so scary anymore and getting started isn’t as daunting because suddenly I’ve realized there aren’t too many mistakes that aren’t easily fixed, and sometimes those mistakes help create something even better than first imagined. It’s good stuff, this new life. Currently I’m following the fashion trade shows in NY and am thinking all good things for the show I’ve been helping to build these past four months. After months of preparation, it’s taking place right now. 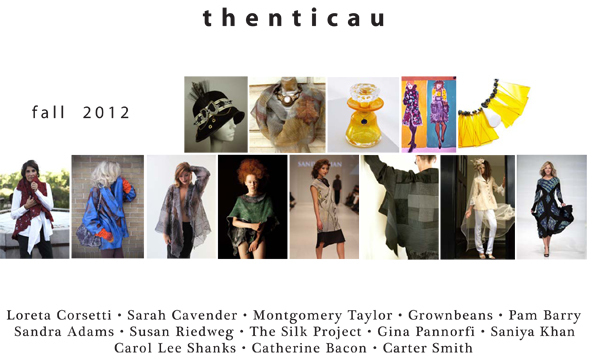 t h e n t i c a u is a collective of primarily American designers who are established and creative, known for individuality in what they do and for excellence in crafting a product with integrity and authenticity. I like that I got to work with some really talented designers on pulling this show together. It’s pretty nice to take pride in my work again and have projects that align with my beliefs. The fact that authenticity and integrity are at the heart of the philosophy that permeates my day-to-day has given me a peace I’d been lacking for several years. Very glad to hear the positive updates! Just one quick correction: “This beats the buffet of mini-candy bars that used to get me through a day.” This was never true, expect for a very short season each year 🙂 It was green bell peppers, cheese sticks, and maybe some cream cheese, and you tried to pass all that off as *lunch*!